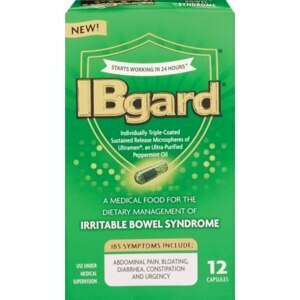 *Based on IBSREST, a randomized, double blind, placebo controlled trial of IBgard. Individual results may vary. **Among gastroenterologists who recommended peppermint oil for IBS. Alpha ImpactRx ProVoice October 2015 survey. As directed by your physician. (Usual adult dosage: 1-2 capsules, as needed, up to three times a day. Take at least 30 minutes before or after food, with water. Do not exceed eight capsules per day. Swallow capsules whole or mix the contents of the capsule with applesauce. Do not chew). Keep out of reach of children. If pregnant or breastfeeding, ask your physician before use. Do not use if foil imprinted with IBgard is torn or missing.